http://durgan.org/2016/June%202016/17%20June%202016%20Rabbit%20Protection./HTML/ 17 June 2016 Rabbit Protection. 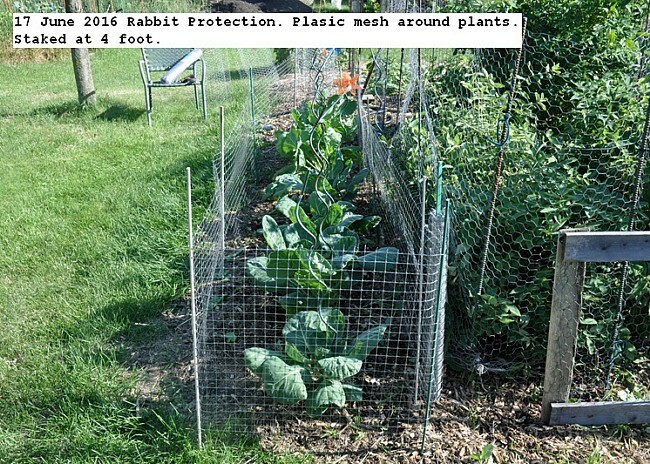 I found this plastic poultry netting and decided to give it a test to keep rabbits from some of my plants. I have been using chicken wire cylinders and am assuming the plastic will be more convenient to handle. The mesh was placed around 8 Brussel’s Sprout plants and supported every four feet by a plastic stakes woven through the one inch mesh. This entry was posted in Uncategorized and tagged Plastic mesh, Rabbit Protection. Bookmark the permalink.